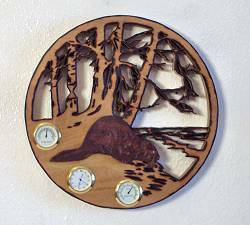 This functional piece of handcrafted wall art shows us a leather carved beaver in the forest. Wood burned accents add depth and distinction. Mini quartz clock, thermometer and hygrometer complete the piece. Cut from 3/4 inch Red Oak it hangs 10 inches in diameter.